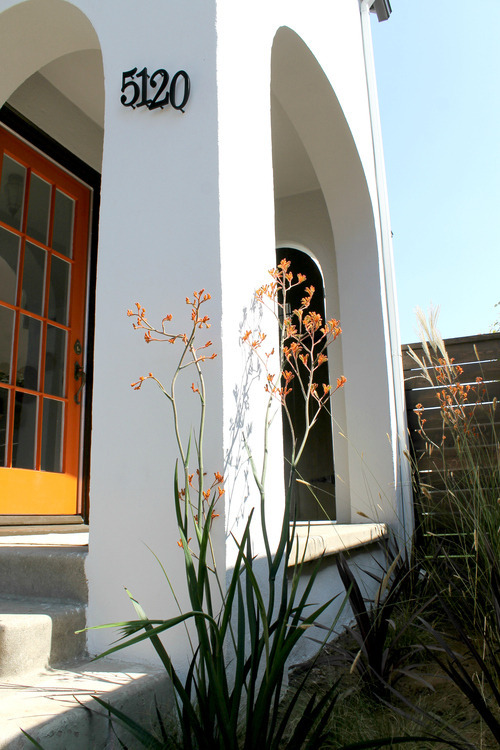 The bright orange painted mullioned glass door commands attention with an instant graphic punch. 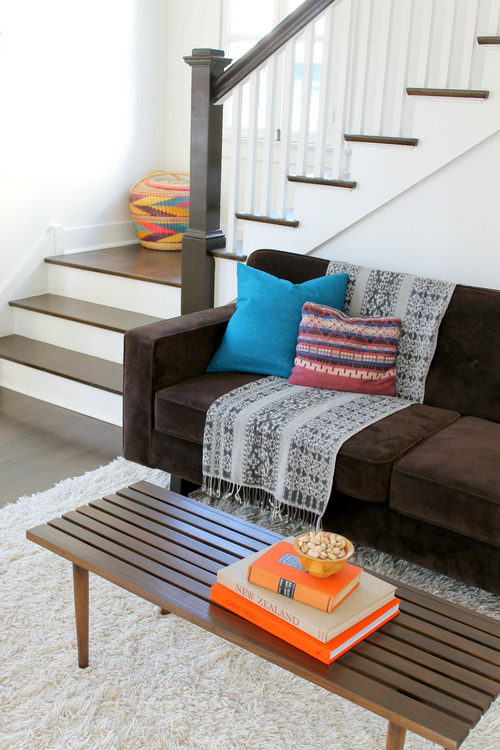 We loved how the staircase provided the visual interest above the couch. No art necessary! On the opposite wall, thrifted baskets create the focal point. With no space for side tables, an oil-rubbed bronze apothecary floor lamp solves this common design dilemma while adding an industrial element to this cozy space. 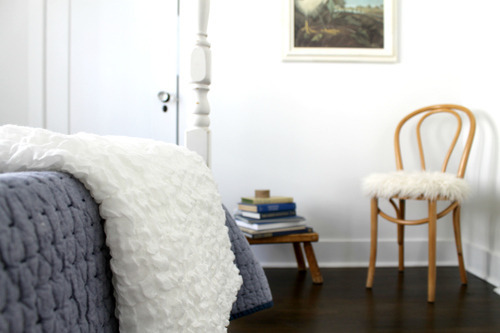 A white shag rug provides contrast and lightens up the dark hardwood floors. 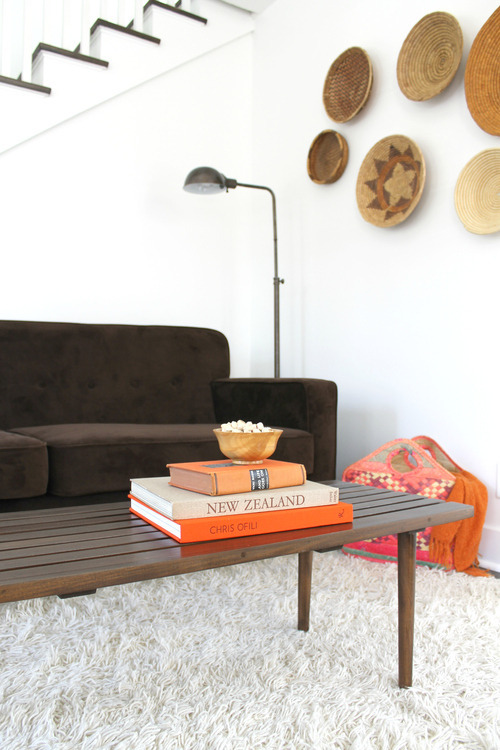 A dark Room and Board-style sofa gives a grown-up vibe to an otherwise playful room. 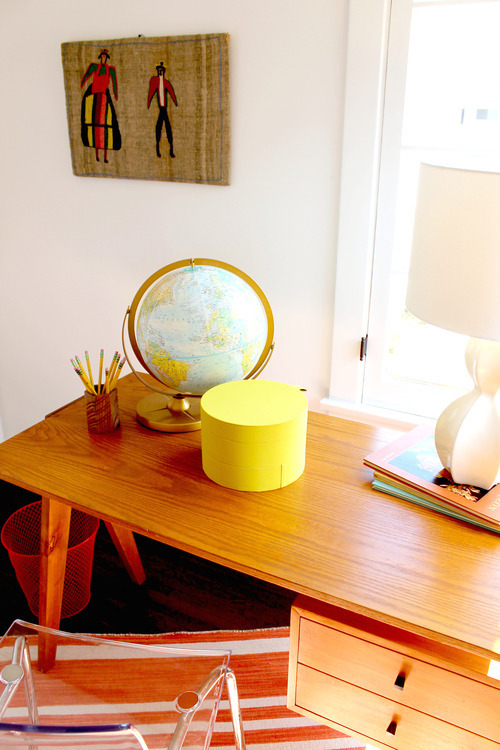 A vintage neon basket unifies the colors used in the space. 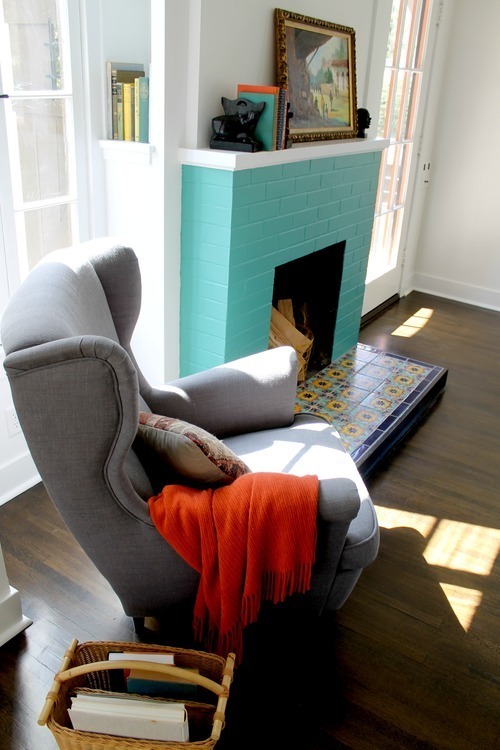 Our color scheme for the living room was inspired by the bright aquas of the vibrantly tiled hearth. The MCM lines of the IKEA Strandmon chair are a welcome antidote to the linear fireplace and other rectangular elements of the room. We kept the styling of the kitchen simple to parallel its modern lines; Repetition was key to accomplish this look. 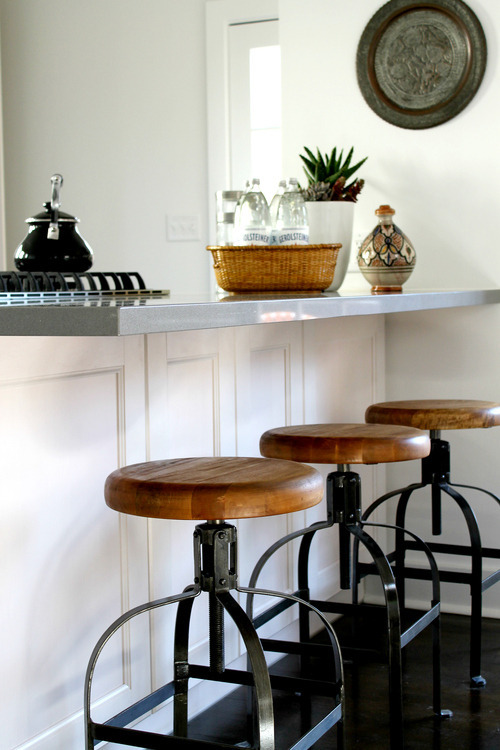 The rusticity of these industrial swivel barstools complement the kitchen’s sleek finishes. A hodgepodge assortment of Eames molded dining chairs and IKEA Tobias chair infuse this dining room with an eclectic collected look. A Greek key rug adds a touch of Regency Chic to the mix. The nature study prints (actually wrapping paper, believe it or not! ), are from Baller Art in Silver Lake. For $5 each, they’ve got to be the least expensive art this size we’ve devised thus far! Layered bedding creates coziness on a minimal IKEA Malm bed. Matching white ceramic lamps lend a touch of sophistication to this master bedroom. 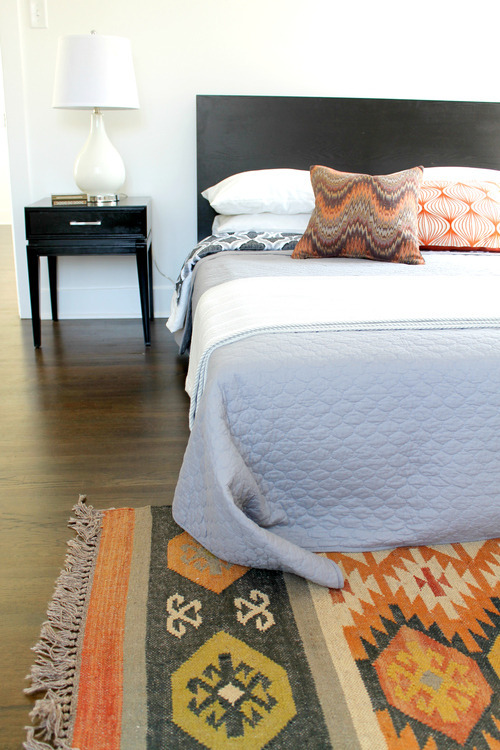 The colors of this kilim rug tie in the colors of the room’s various fabrics. A vintage white four-poster bed is a a sweet addition to this petite bedroom. 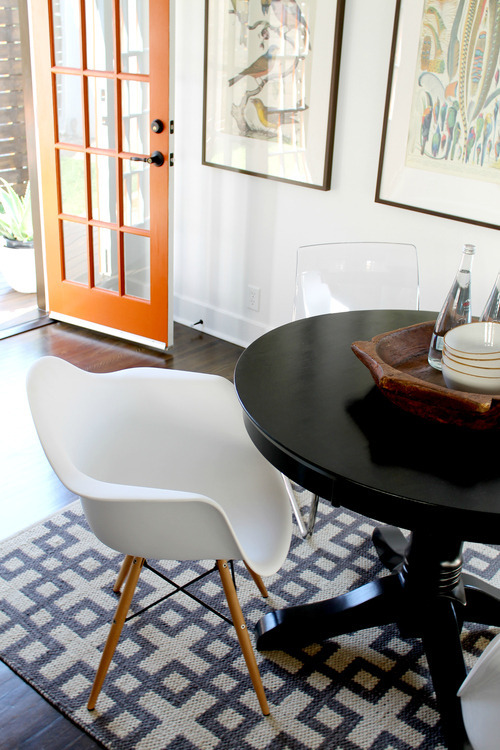 A Thonet chair with a flokati seat finishes out this corner. A coral and white striped rug brightens the room and sets the stage for the room’s color palette. An IKEA Tobias chair provides desk seating while taking up no visual space in this small office. 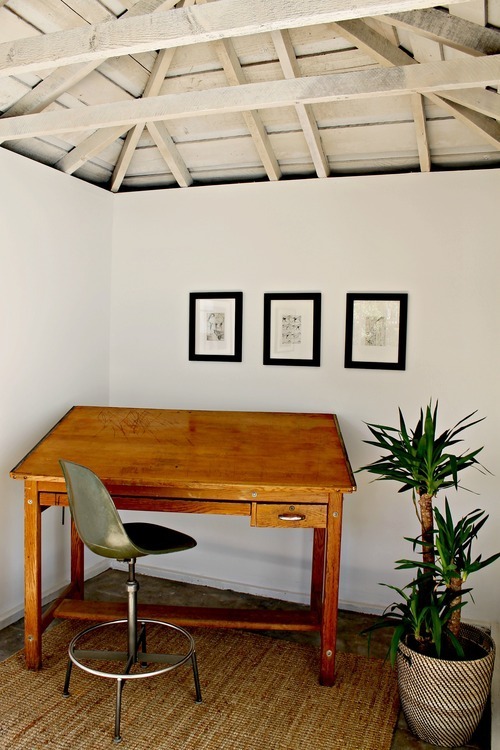 We filled out this artist studio with the homeowners’ vintage wooden drafting table and industrial Herman Miller swivel stool. We added a jute rug and sketches to complete the look.